The candle we lit in September 2007 for our service men and women still burns at Wrightslaw. We wanted to know what we could do to put a smile on a soldier’s face. We learned there were dozens of websites and dozens of ways to support our troops, so we shared this information for those of you who wanted to help. When we said that kids can take action too, your response was heartwarming. The Wrightslaw Team says a special “thank you” for your wonderful letters of thanks and support for our troops. 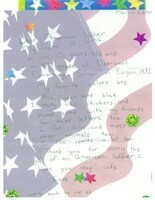 We send your great letters to soldiers in the 5/2 Stryker Brigade Combat Team 1-17th IN BN in Afghanistan. Read what the Wrightslaw Team kids have been doing to support moms and dads in Iraq and Afghanistan at Be A Hero…To A Hero. This entry was posted in Military Families and tagged Be a Hero to a Hero, Military Families by Wrightslaw. Bookmark the permalink.